Artist and adventurer PALME from Berlin in Germany does not participate for the first time with his contributions and actions in the SPIRAL-CHANNELS project! He participated since 2007, with sending of his contributions, almost in every next step in the developing of this interdisciplinary work in progress project. But this is not everything... He is one of not so much connected international artists and creatives in the project who realize his own ideas based of the philosophy and the sense of SPIRAL-CHANNELS project. 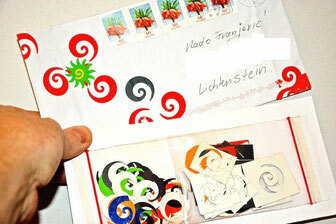 These moments are very much accepted and loved by the leader of the project Vlado Franjević. As you maybe remember, PALME made in 2013 these great performances in Gambia and Senegal in the frame of our TO EARTH WITH LOVE actions. 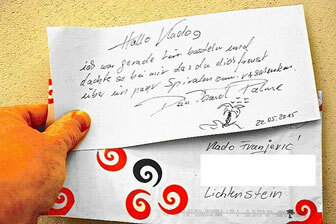 Now was Vlado again surprised by PALME who sent him, after the sending of a contribution to the project in Liznjan 2015 also this letter with little SPIRAL-CHANNELS stickers... Simply but great accent on common growing up! "This is my contribution to Vlado Franjevics SPIRAL-CHANNELS Project ''WORLD IN 3 WORDS' in HR-Ližnjan 2015." THANKS so much for your collaboration and sharing of the Invitation… If you have any question before you send us the contribution please ask down here in the comments! Cool dann sind sie doch endlich angekommen. Ich hoffe du hast Spass mit den Stickern. Du kannst Dich doch noch an die Aftershowparty mit Thomas im Sommer 2010 erinnern. War eine der coolsten Aktionen. Liebe Grüsse an Thomas.